The other great thing about spring is that the chickens have all finished (or mostly finished) moulting, and have started laying again. We’re getting 4 – 10 eggs a day. So today was an egg-using-up day. Using up eggs isn’t a chore. I’ve always liked eggs and I love baking, so.. scrambled eggs on toast for lunch, hard-boiled eggs to have as morning tea treats tomorrow, and my new favourite tea-time treat / dessert: clafoutis. I can’t claim to be entirely authentic on this, since I made up the recipe based on having made it once before, years ago, and having a broad general idea of what the dish is mean to look & taste like, but it’s pretty nice. Beat all those ingredients except the fruit together into a smooth batter. You may need to use a whisk. The consistency should be similar to pancake batter. Pour the batter over your chosen fruit (I used caramelised chopped apple, but any fruit will do) in a cake pan or pie plate. Bake at 180 degrees C for 25 min, or until completely set. Serve warm (although cold is still pretty good). If you want to use caramelised apples as per my experiment this afternoon, roughly chop your 2 cups of apple (about 4 – 5 small apples), then pan fry with 2 Tbs butter, 1 Tbs cumquat & lime jelly (yeah, I made that too – replace it with marmalade for the closest approximation), 1/2 tsp cinnamon, and 1 – 2 tsp brown sugar. Cook the apple until the jam and butter have melted and dissolved the sugar, the whole lot is bubbling and smelling of delicious appley caramel, and the apple is almost cooked. we have a little list..
Last weekend, the auto-waterers for the chicken coops went in. K spent most of Sunday digging and cutting sections of hose, attaching taps and connectors and the float-valve controlled water dishes to each of our coops. We have two up-cycled 200 L plastic olive barrels as the water reservoirs, which should only need refilling every couple’ve weeks even in summer. It’s a pretty big item to tick off the to-do list, because making sure the poultry have access to fresh water all day every day through summer is a real pain when using the standard pet-shop waterers (max size: 10 L; max lifetime: 2 yrs of UV before they crack and leak). And the chickens are our only actual productive farm element so far, so it feels good to get them sorted out. Especially since they’ve started laying again. This weekend the coops got sand to cover the incredibly awful muddy muck that the ‘deep litter’ had turned into with the rain, and corrugated iron roofing over half the run area so there’s some outside space which will be mostly dry in the rain and shaded in the summer. Neither of those things were on the list, but they should have been. The next actual list item is doors for the quail cages, and fully enclosing the chicken runs to make them fox proof (as opposed to merely fox resistant, which they are now). On the water-related front, the next big thing (other than getting the last water tank in, and placing a 10,000 L fire tank near the gate) is setting up some auto-watering for the fruit trees. Another few olive barrels and some drip lines, ideally with auto-timers, would save us hours and hours of work every evening through the middle of summer. Last summer we watered the fruit trees by hand, with watering cans, every day. The list is a little daunting, but it’s good to have the entire list of things to do up as well. It’s stuck on the pantry door, and every time we finish something, it gets crossed off the list. We brainstormed all the things we could think of that we need to do, and agreed that until next year no new items can be added to the list. So it will get smaller, and we won’t have the despair of trying to catch up with an ever-growing list. We started with 95 items on the list, and we’ve completed 9 so far (with another 3 or 4 which are almost completed, but not quite). There are quite a few items which are in progress, too. It seems slow, but – like watching trees grow – these things do take time. We’re getting there. Not an activity post today, but it’s been a cold rainy day with no notable achievements beyond running a bunch of meetings at my day job. So instead, I’m writing about chickens. Chickens (Gallus gallus domesticus) are the archetypal poultry in Australia, the bird that everyone thinks of when they think of farmyards. They’re descended from the Red Junglefowl (Gallus gallus), and gentic studies have shown multiple points of origin across South-, East and South-East Asia. Due to selective breeding, both for specific traits and for simple survival ability in different environments, there is a wide variation in size and colour among chickens. 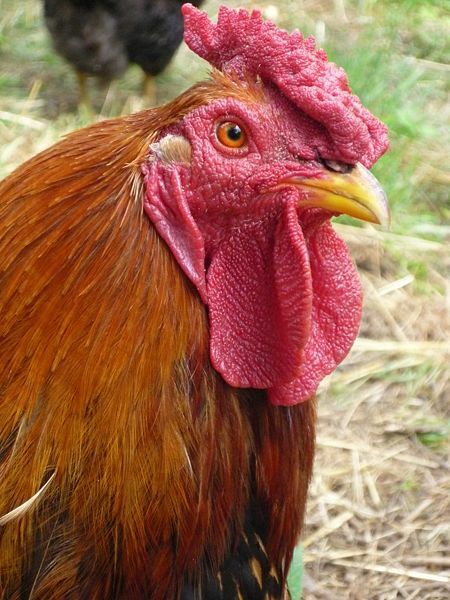 The largest can weigh as much as 4 – 5 kg (in the case of the Jersey Giant), while the smallest breed of bantam (the Serama) may weigh as little as 500g when fully mature. Their colours range through all shades of brown and beige, black, white, cream, and grey, both solid colours and in patterns. Most chickens can fly, although the very large breeds become too heavy at maturity to fly effectively. Silkies have primitive dinosaur-like feathers which do not shed water and cannot support flight. Most chickens do not swim, although they will splash about in shallow water like any other bird. Their normal social structure of a flock might include one or more roosters and several hens. The dominant rooster will mate most often, but the less dominant roosters might also mate, especially with the less dominant hens. Hens will tend to lay together in the same nests, and will happily raise each others chicks if they hatch them. Hens may “go broody” once their nest is full (a full clutch is usually about 12 eggs), which means they sit on the eggs keeping them warm and turning them as necessary. 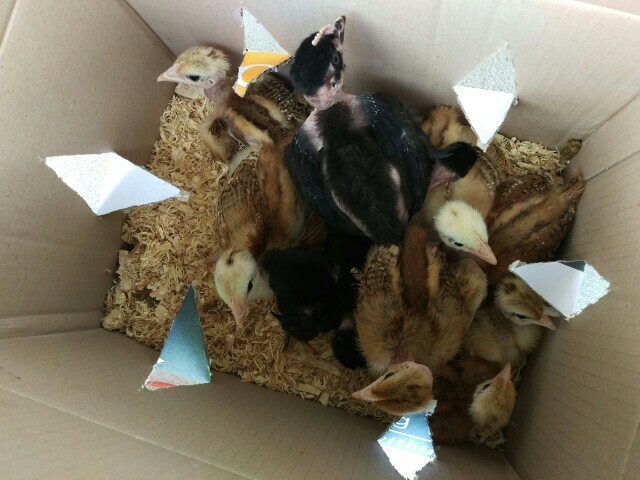 Eggs hatch after 21 days at approximately 38 degrees C. Not all breeds will go broody – some have had the instinct bred out of them – and not all individuals within a breed will go broody. Some hens are better mothers than others. Most modern chicken breeds begin to lay at about 6- 12 months old, and lay regularly until they are 3 – 4 years old; after that they will often continue to lay sporadically. Commercial laying chickens are usually slaughtered after 12 months of laying as their egg laying capacity diminishes. Chickens have been known to live to be 16 or 17, and form distinct friendships and social relationships with other chickens, as well as other animals and birds, including humans. They’re reasonably smart, and can be trained with treats and a clicker (and a lot of patience). Chickens bred for commercial meat production are usually slaughtered by the time they’re 6 – 8 weeks old, so their muscles are still tender. They grow so fast that if left to mature, they would die or be crippled by the weight and mass of their over-muscled bodies and insufficient bone growth. We’ve tried a few different heritage breeds of chickens, and there is a clear winner for us: the Turkish Naked-Neck, aka Turken. This breed has a gene which causes them not to grow feathers on their necks, and decreases the number of pin-feathers (fine, hair-like feathers found all over the body), making plucking much easier. The lack of neck feathers make Naked-Neck chickens better able to handle hot weather, as they have more exposed skin to lose heat from; in cold weather they simply huddle down a bit and their shoulder feathers insulate their necks as well. They also seem to be smarter than your average chicken, and friendlier to humans too – or at least, less scared of humans, and easier to tame. We’ve had a couple’ve Barred Plymouth Rocks, and they’re fluffy and cute, but not especially bright. Silkies also have not so far shown themselves to be very smart, although they are sweet birds. We’re hatching some Silkie eggs in about a week (they’re in the incubator now), so we’ll see about silkies with a known background and environment (the last ones I got as 3 month old birds, and hadn’t been well socialised). My one Malay Game rooster is a scaredy cat, but very gentle with humans (and so far with the other birds as well, although he is twice their size so I’m keeping an eye on that in case he decides to become a bully). The two Australorp crosses we’ve had have been very dominant, and quite aggressive with the other flock members. They’ve also picked up gastro a few times and haven’t been very healthy; that might be the individuals rather than a breed trait though. Wyandottes are, in our experience, very sweet and gentle birds, with lovely personalities – but a pain to pluck because of all the pin-feathers. We do still have some Wyandottes, though – I like them in spite of having to singe pin-feathers off the extra cockerels when we pluck them. They’re also very pretty in my opinion; I love the silver laced colour combination. Our current group of five pullets (hatched a few months ago) include four gold laced, and one gold laced blue. The Feathersite is a good resource for info on various breeds (not just of chickens – they have ducks and geese and all sorts of poultry). I’m happy with naked necks as my main birds, and the collection of odds & ends I have for a breeding project, but I am also considering a sideline in seabrights just because they’re pretty. Kinda like smart quail, although they don’t lay as well as quail (about whom another animal profile, later). Water – Chickens, like all other animals and birds, need clean, fresh water to be available at all times. They have a tendency to kick dirt, food, and poo into their water, so it will need to be cleaned and changed fairly regularly. 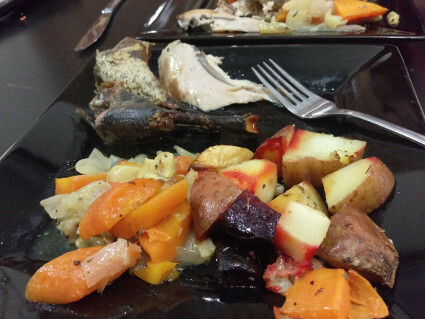 Food – The natural diet of chickens is around 80% seeds and plants, and 20% insects. Chicks need 18 – 22% protein in their feed, and adult chickens need 15 – 18%. Insects are the best source of protein for a chicken, but they can digest plant proteins too, and will quite happily eat meat (including killing and eating mice and small lizards). Chickens can live on just pellets, but they benefit form having access to greens as well – pasture, vegetable scraps, weeds, etc. They also love most fruit (but DO NOT feed them avocado, as it is highly toxic to them). Adult chickens need shell grit to be available at all times, as they eat it for calcium which they need for producing egg shells as well as their own bones and for general health. All chickens also need regular grit (course sand and small pebbles) to be available, to help them grind and digest their food. Shelter – Chickens are fairly hardy, but they need somewhere to roost out of the rain, and where they are protected from predators. There should also be perches available for them in the coop, with a minimum of 20cm perch space per bird. Nesting Space – Chickens will lay an egg every few days (some birds lay daily, others lay once a week, most are somewhere in between those two extremes). They need a private space to do this – a covered box, protected from the weather, and 35cm in each dimension. At least one nesting box is needed per three birds (they do share, but more than one bird may try to lay at the same time). Space – A minimum of 0.3 sqm per bird for indoor coop space, and 1 sqm per bird of outdoor run space is recommended by most animal welfare organisations. Obviously, more is better if you can do it. Warmth – Adult chickens will do fine in most weather, although they can become ill if they get wet and cold (Silkies are especially prone to this, as their feathers don’t shed water well). Chicks need a heat source for the first 4 – 6 weeks, depending on the weather, starting at 37°C and gradually decreasing over the time. Insect control – chickens aren’t as good at eating all the pest insects in your garden as guinea fowl, but they do control snails, slugs, and cockroaches with glee and enthusiasm. Eggs – On average, an egg every 2 days is a reasonable rate for most laying breeds. Most chickens slow down or stop laying during the coldest part of winter, and during spring when they’re moulting (their energy goes into growing new feathers instead). More chickens – eggs which are to be incubated should be put into the incubator within 7 days of being laid. They should be incubated for 21 days at 36 -39°C (with best development at 38°C) and a relative humidity of 50 – 65 %. Eggs must be turned 3 – 5 times per day to avoid the yolk sticking to the inside of the shell. Meat – chickens are delicious. Guano – chicken manure is just as good as seagull, or bat manure for providing phosphorus and potassium to plants. It is high in nitrogen so it should be composted before use, or used sparingly. Feathers – every time you kill a bird to eat, you will need to either pluck or skin it. Chickens are usually plucked, and the feathers can be retained for use in craft or art projects, to add to compost, or (the softer down feathers) to use as stuffing for cushions, toys, etc.